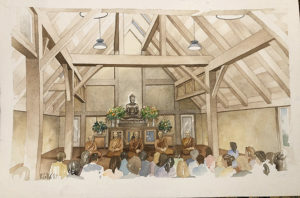 The dhamma hall is the heart of this project, and it will accommodate our growing community. It will have an approximate area of 1,500 square feet, with a vaulted ceiling supported by a timber frame interior. The area in front of the shrine, will provide space for the Sangha. The rest of the hall will have room to accommodate approximately 150 people, and an additional 50 people can be accommodated in the back foyer. The focal point of the shire will be our new bronze Buddha rupa which has been generously donated by our well wishers. With completion of the new hall, the existing sala will be re-designed as a dual purpose reception area and dinning area for lay guests.